A Tale of the Atlantic. Author of 'The Sea Serpent,' 'Dwarf of the Channel,' 'Mornilva,' &c.
CORNER OF COURT AND TREMONT STREETS. The Island of Trinidad. Landing of the Earl of Derwentwater and his party upon the Isle—Its Enchanted Scenery. Unnatural Sounds. Sudden appearance of the Notorious Pirate Blackbeard. Situated upon the broad bosom of the vast Atlantic Ocean, about two hundred leagues from the coast of Brazil, is a small but fertile island, which has retained from the period of its first discovery, the familiar name of Trinidad. This beautiful island, although a lovely and sequestered spot, has been for various general reasons, but rarely visited by the hardy mariners of the deep, and never permanently settled or inhabited by man. Its surface is agreeably diversified with high hills and low beautiful valleys, whilst its circumference is almost wholly surrounded by a chain of dark, rocky cliffs, which gives to this remote island a somewhat fantastic appearance to the eye of the beholder, as he approaches it from the sea. On this circumscribed but favored spot of earth, nature seems to have reveled in almost boundless profusion, scattering here and there throughout its valleys her choicest favors, in the shape of delicious tropical fruits, and ever green luxuriant herbage, whose fragrance as it mingled with the pure fresh breeze of the ocean, has proved to be a sweet balsam of health to many a sick and weary mariner as he sailed within reach of its invigorating influence. Although this fair island possessed no convenient harbor for its vessels of any class, still there was upon its southern side, a small piece of white sandy beach, upon which a single boat might easily land, and here upon this same spot, a boat did land about an hour after sunrise, on the thirty-first day of October, 1717. The boat in question, was occupied by six persons, who, as soon as its keel grazed upon the clear white sand, immediately disembarked and dispersed themselves singly and by twos, in different directions for the purpose of enjoying a short ramble amongst the shady trees and fragrant foliage of the island. The party to which we have alluded, consisted of the Earl of Derwentwater, a noble looking gentleman, who, apparently had but just spent the prime of life,—his fair niece, Mary Hamilton, a stately and beautiful girl, about twenty-three years of age,—Arthur Huntington and his twin brother, Henry—a huge red headed but fat and good natured son of the 'Emerald Isle,' who acted in the capacity of servant to the earl, and last, though by no means least, a beautiful golden haired, cherry cheerful nymph of fourteen, whom for the sake of a name we shall call Ellen Armstrong. 'And I think you must be a very great lover of it, if you prefer this hilly, iron bound island, to the level green sward of Derwent park,' replied the earl. The vessel to which the earl alluded, the white sails of which were just visible to his eyes and those of his companion, from the eminence on which they stood, was the honorable East India Company's ship Gladiator, to which belonged the boat that had conveyed the Earl and his party to the shore, in the manner before related. She was bound to Rio Janeiro, from thence to Batavia, and as they had a long passage from the Downs, Captain Rowland was easily persuaded to allow his distinguished passenger the long coveted recreation of visiting the small though beautiful island of Trinidad. 'Rowland is going to make a long tack, this time I guess,' continued the earl, as they both stood watching the still lessening sails of the huge Indiaman. Having thus spoken, Mary Hamilton accepted the aid of the earl's proffered arm, and both together leisurely descended the hill, intently gazing upon the sea, they did so as if watching the slow progress of the ship, which was now standing in towards the land. Before Mary could find words wherewith to reply to her uncle's bantering speech, a low sweet strain of mournful music, fell suddenly upon the ears of our astonished voyagers, which as it died slowly away, like the departing imagery of a vivid dream, was succeeded instantly by a loud shout of bacchanalian laughter, which echoed wildly for a moment amongst the rocky cliffs of the island, then all was calm and silent as before. 'The music must have proceeded from a flute,' said Arthur Huntington. 'And it must have been played by a master's hand,' interposed Mary Hamilton. 'What strange apparition is this,' exclaimed the earl involuntarily, as this singular personage stood erect before him. After giving utterance to a loud derisive laugh, whose echo as it reverberated amongst the rocky cliffs, sounded like the fitful mirth of numerous invisible demons, the pirate thus answered the bold summons of the earl. Description of Characters. Sweet Ellen Armstrong. Sudden appearance of the Piratical Brig. The Earl's Request. Blackbeard's Decision. The Desperadoes. The decision is enforced. Perilous situation of Mary Hamilton and Ellen. In order to carry forward the plan of our story in a consistent and intelligible manner, it becomes necessary for us, here, to briefly explain some important particulars relating to the history of the Earl of Derwentwater and his companions, previous to their landing upon the remote Island of Trinidad, as related in the course of our first chapter. The intelligent reader of history, will undoubtedly recollect, that the year 1715, (two years before the time chosen for the commencement of our romance,) was rendered famous by the important insurrection which then took place throughout England and Scotland, in favor of the Chevalier de St. George, or James the Third, a proud and haughty scion of the Roman Catholic house of Stuart. This singular and renowned rebellion, although premature in its beginning, and short in its duration, caused during its continuence, the Hanoverian incumbent of the English sceptre to tremble for the permanence of his seat on the throne, and though he at first pretended to despise both it and its authors, he was finally compelled to use vigorous and extraordinary means to bring it to a summary and fatal conclusion. Through the instrumentality of foreign troops, and the numerous cabels which sprang up in the rebel camp, King George was soon enabled to quell this Jacobitical insurrection, which otherwise might have proved formidable enough to have overturned the Protestant dynasty of the British realm, and established in its place the despotic hierarchy of the Church of Rome. So well aware was the reigning monarch and his ministers of the truth of the above important fact, that they deemed it imperatively incumbent upon them, in order to deal a death blow to all future attempts of the same nature, to punish all the noblemen and other leading characters connected with it, in the most severe and exemplary manner. Acting upon the above principle, the Privy Council caused immediately to be arrested, about thirty of the Scotch and English nobility, the majority of whom fell by the bloody axe of the executioner, whilst the remainder were sentenced to perpetual banishment. Amongst this latter class of insurgents, was George Armstrong, Earl of Derwentwater, who succeeded to his father's rank and title, immediately after his decease, which happened somewhere about the year 1694. Some time previous to his death, however, the old earl, through his influence with the crown, had obtained the grant of a large tract of land in the province of South Carolina, near the mouth of the Roanoke river, which was soon after settled by these minor and remote branches of his own extensive family, whose fortunes had become sadly dilapidated by the frequent intestine revolutions which happened in Great Britain during the latter part of the seventeenth century. Upon the accession of Queen Anne to the English throne, the old earl fell into disgrace with the ministry, and with his family retired soon after that event, to his plantations in America. Shortly after his arrival, however, the change of climate proved fatal to his advanced age, and brought on an intermittent fever, which ended his life, and caused his only son, George Armstrong, to succeed to his grand title and extensive estates. Although the character of the young earl, differed in many important respects from that of his father, still, in one great feature there was an exact resemblance between them. The disposition of the old earl was stubborn, artful and avaricious, whilst that of his son, was frank, open and generous. In temper, the former was cunning, revengeful and unforgiving, whilst that of the latter, though hasty and violent in its outbreaks, would a moment afterwards pass away, leaving no lingering trace of its harsh and cruel effect upon the young earl's strong and vigorous mind. Here, the wide contrast between the characters of the father and son ended,—for the same vaulting ambition which had animated the father, through a long and eventful life, descended upon the son in its full and unstinted measure, whilst in blind and extravagant adherence to the house of Stuart, and the Roman Catholic religion, the son greatly outstripped the father, who had been moderate enough in his political and religious machinations to ensure to him his titles, and cause his estate to remain unconfiscated, and in his own particular keeping. Instead, however, of copying the temporizing and crafty policy of his father, the young earl, soon after his accession to the title and fortune of the former, began openly to hold a correspondence with the court of the pretender, which finally resulted in his becoming one of the first noblemen to assist in raising the rebel banner in Scotland, in the year 1715. After running through a short career of active service, George Armstrong the last Earl of Derwentwater, found his vast estates confiscated to the crown, and himself a prisoner in the Tower of London. This event happened during the spring of 1716. Early in the summer of the same year, he, with a number of others was brought to trial before a special commission appointed for that purpose, found guilty of high treason, (and although, others who had taken a less active part in the rebellion, were doomed to immediate execution.) The earnest intercession of the French Ambassador at the court of St. George Armstrong, to be commuted to foreign and perpetual banishment, and in accordance with this sentence, he was about to join his brother-in-law, a rich South American merchant, who was located at Rio Janeiro in Brazil, when his progress was somewhat singularly arrested by the adventure commenced in our first chapter. Many a long and bitter hour as she passed from childhood to youth, and from thence to woman's estate, did the future heiress of the House of Hamilton ponder sadly over the mysterious and cruel prohibition of her noble aunt, and as she thus pondered, a strong but indefinite presentiment of future sorrow and grief and misery in connection with the fate of her real parents became so completely fastened upon her mind as to cause her whole deportment to become tinged with a sort of sad and mournful melancholy, which all the seductive arts of a London life could not eradicate. Although numberless suitors of almost every variety of rank and character had knelt in real and assumed adoration before the virtuous shrine of the beautiful West Indian heiress, she had turned from them all with almost loathing indifference, and the summons which she received (about three months previous to the commencement of our story) calling upon her to join her father, in company with her uncle, found her at the age of twenty-three, unmarried and unengaged. In less than a month however, after her embarcation on board of the Gladiator, a gradual change had taken place in her whole demeanor, caused by the deep interest she found herself constrained to take in the person of Henry Huntington, the son of Sir Arthur Huntington, who had followed the fortunes of the Earl of Derwentwater during the rebellion, and who had chosen also to share his banishment. The baronet was a fine specimen of the old English cavaliers, who had freely spent the greater portion of a handsome fortune in the service of the Stuart family, and now, when nearly at the close of a long and eventful life, he with his twin sons (whose poor mother had died in giving them birth,) had left their own dear and native soil, to live, and perhaps to die in a foreign land. These twin sons and brothers, Henry and Arthur Huntington, had arrived (at the time of which we are speaking,) to the age of twenty-two, and in personal appearance they might have been considered as correct models of manly beauty. Their forms were tall, erect, and muscular, and thus far, each was the exact counterpart of the other, but here the resemblance between the brothers ended. In temper and disposition, Henry was mild, generous and forgiving, whilst Arthur was sanguine, violent and irascible. Although they had both been educated alike, they differed very widely in strength of mind and capacity of intellect, for the mind of Henry was strong, and undeviatingly based on the principles of right, while that of his brother was weak and vacillating. The affections of the former when once fixed, were immoveable as the solid rock, whilst the passions of the latter, although more violent, were not capable of remaining fixed for any length of time on any particular object. These two brothers had both felt a partiality for Mary Hamilton, and so far as Henry was concerned, the partiality was fully reciprocated, but she looked coldly upon Arthur, which caused him to turn from her in disgust, and transport his vacillating affections to sweet Ellen Armstrong, whom, as being our principal heroine, we must now proceed briefly to notice and describe. At the time of her introduction to the notice of our readers, she was to all outward appearance a bright and joyous being, who seemed to think of nothing but the happiness of herself and those around her. Although but fourteen summers had then passed over her head, and her fair form was slight and fragile as the first pale flower of Spring, her high and noble thoughts, as they escaped from her vermillion lips in soft and musical words, gave sufficient evidence that her mind and intellect was far beyond her years. She was, in very fact and deed, a singular and uncommon being, such an one as is rarely to be met with in the daily walks of life. Her form, though slight, was faultless in its proportions, her countenance was intelligent and highly expressive, whilst in her fair complexion, the pure red and white, seemed to have been most judiciously combined. To all these embellishments, permit us to add, a head of luxuriant hair, of a golden auburn color, with a pair of large and sparkling blue eyes, shaded by long, dark, silken eye lashes, and the personal portrait of our heroine is complete. Her character, also, in many of its traits was as good as her person was beautiful. The bland sweetness of her disposition and the apparent mildness of her temper, had even in the years of her childhood, endeared her to all who happened to be within reach of her acquaintance, but still she had faults, for there are none perfect, no, not one. Ellen Armstrong was fanciful, wayward, and highly romantic, a being of strong and ardent passions which would sometimes, in spite of the watchful vigilance which she always endeavored to keep over them, get the better of her right judgment, and high sense of rectitude. As he returned home from an exciting session of the House of Peers, late on a cold night in December, 1703, (nearly 14 years previous to the date of the commencement of our story,) he was greatly surprised, upon entering the drawing-room of his elegant mansion, to find his wife busily employed in fondling and carressing a beautiful infant, apparently not more than two or three weeks old. 'What does this all mean, Lady Armstrong?' exclaimed the earl, as soon as his surprise had in a measure subsided. 'To the Right Honorable George Armstrong, Earl of Derwentwater. After having read the above singular epistle, the earl held a long consultation with his amiable wife, which resulted in their concluding to comply with the request of the mysterious writer, to adopt the poor foundling as their own daughter, and at the same time, they determined never to reveal to her the secret of her strange advent amongst them. In accordance with these resolutions a suitable nurse for the young infant was immediately procured, and when it had reached a proper age, it was baptized by the name of Ellen Armstrong. Such kind readers, is a brief description of the person and fortunes of our heroine, previous to the commencement of our narrative, and now presuming your generous permission as granted, we shall now proceed to extend the great chain of events connected with our singular and romantic history. 'There seems to be nothing very strange or alarming about that,' answered the earl. 'How so?' asked the earl. 'Because the small vessel appears to be a piratical brig, whose commander, I am well assured, will not pass a rich Indiaman without politely undertaking to inspect his inventory and overhaul his cargo,' replied the pirate. 'Until their safety is duly cared for, I shall not stir from this spot,' coolly replied the pirate. 'You may go, but the ladies will remain,' said the pirate decidedly, who at the same time gave a loud peculiar whistle, and the next moment the earl found himself and his companions surrounded by a band of ferocious desperadoes, who, with brandished weapons, stood ready to execute the commands of their leader. Although the earl and Arthur Huntington resisted manfully, their efforts were unavailing, for whilst the two ladies were borne off in one direction, they were quickly hurried on board their boat and compelled by the threats of their ruffianly assailants to row swiftly towards the noble Gladiator. Mary Hamilton and Ellen Armstrong Captured and conveyed to the Pirate Palace. Contemplated Escape—Frustrated by Blackbeard. Ellen afterwards conveyed on board the Pirate Brig. In spite of their entreaties, the females were ruthlessly torn away from their companions, and conducted by these remorseless ruffians to the pirate's palace. Mary then thought, that the beauty and loveliness of the island, which, but a few hours previous she would not have exchanged for all England, she would now gladly quit for the meanest spot on Briton's Isle. Sweet Ellen murmured to herself that the horrible forebodings she had in reference to the island, were but the precursor of what might be expected. The grandeur and sublimity of its scenery, its isolated position, being surrounded by the waters of the Atlantic—the unnatural music and noises, all conspired to fill the mind of this young girl with the idea that something was about to transpire of no ordinary nature,—and neither was she deceived. A great change however, had been wrought in the course of the last few hours, upon the thoughts and feelings of our two fair captives, a change which had caused reality to usurp for a time at least, the place of romance, and constrained them to gaze with a vacant look upon the superbly natural beauties of the island glen. Therefore with thoughts concentrated upon their immediate personal prospects and fruitless conjectures as to the complexion of their coming fate, the fair captives mechanically followed the footsteps of their guides, who when they had reached the bottom of the hill, suddenly stopped before the open door of a long building which had been ingeniously constructed of bamboo and other light materials well suited for the covering of a cool place of shelter, under the heat of a tropical sun. There was nothing farther, worthy of remark about its exterior appearance, with the exception of its being so thickly covered on all sides by the luxuriant and evergreen foliage of the surrounding trees, as to preclude it from being seen from the tops of the adjacent hills, but its interior contained four large apartments, two of which had been fitted up in a manner luxurious, and even elegant. Into one of these two rooms, whose walls were decorated and hung round with the richest crimson drapery, and which was as richly furnished in every other respect, did the strange guides usher their fair prisoners, after which, they instantly retired, leaving our heroine and her companion to consult together as they might see fit upon their singular and mysterious situation. 'How?' asked Ellen, hardly realizing what she said. 'Through the agency of our friends on ship-board' replied Mary. 'They may have been taken prisoners, by the pirates, as you call them,' interrupted Ellen. 'I'm sure it will not be Captain Rowland's fault, if we are not very soon liberated,' replied Ellen. 'You seem to be rather partial towards this Captain Rowland,' Mary carelessly remarked. Here the voice of the invisible songster again ceased, and although both Ellen and her companion listened long for its repetition, they listened in vain, for it was heard no more. 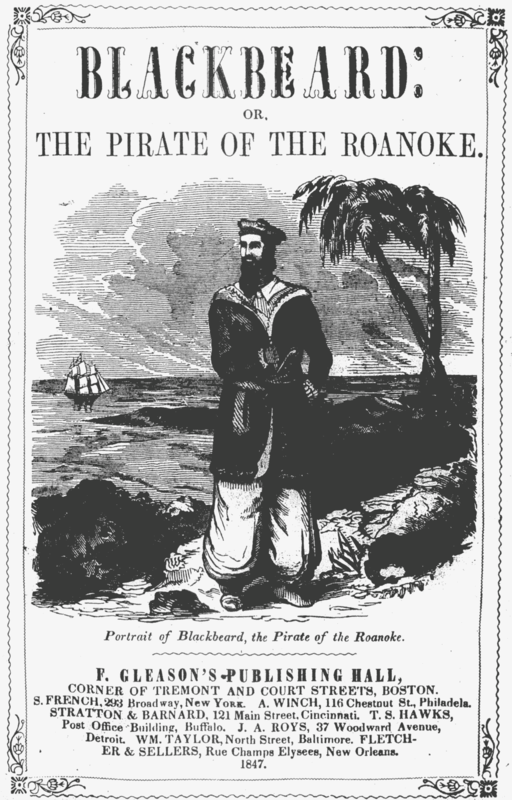 'You talk of escaping from the pirate's palace, as though it were the most easy and practicable thing in the world,' exclaimed Blackbeard, who had abruptly entered the apartment from an inner room, and had stood unperceived behind the captives whilst Mary Hamilton had spoken the words quoted above. 'Name, oh name it,' exclaimed Mary, eagerly. As these dread words fell into accents cold and calm upon her ears, the self possession which had distinguished her throughout the foregoing conversation, suddenly passed away, and poor Mary Hamilton sunk utterly bereft of consciousness upon one of the richly cushioned seats which ornamented the apartment, while sweet Ellen Armstrong almost as terrified as her companion, looked vacantly around, and as if not comprehending the import of the pirate's significant speech. 'And her companion also?' asked Violette. The pirate here whispered a few words in the ear of the dark female, who immediately after approached the seat where Mary was reclining, stamped thrice with her tiny foot upon the floor, when two hideous looking negressess entered the apartment, and at a sign from Violette, they instantly removed the still prostrate form of Mary Hamilton into the inner room. This last singular and unnatural proceeding totally confused the few ideas which had remained to poor Ellen after her friend had swooned, and as the loud booming of distant cannon fell upon her ear, she too would have sank fainting to the floor, had not Violette sprang forward and caught her in her arms. Marine Phraseology. Approach of the Piratical Brig. History of Captain Rowland. A Conflict expected. A Boat from the Shore. The Ship Surrenders. Sudden appearance of Blackbeard and Ellen Armstrong on board of the Brig. Heroic Conduct of Arthur Huntington. Ellen steps between him and Death. The Result. Ellen in Despair. 'Did ever you hear the reason why?' asked Summers. 'And so can I, too, sir,' exclaimed Bill, after having looked for a few moments in the direction intimated. 'It's a strange sail, then, sure enough,' answered the third officer. 'I should take her to be a full rigged brig,' answered Summers. 'Halloo; what do you see?' answered the captain. 'What makes you think so, sir?' asked the first lieutenant. 'Perhaps it may be some vessel in distress,' suggested the lieutenant. 'Where?' exclaimed Rowland, eagerly, snatching his spy-glass from its place in the cabin gangway. 'Ah, I see her,' exclaimed the captain after he had looked for a moment through his spy-glass in the direction intimated. 'Aye, aye, sir,' answered the first lieutenant. Leaving for the present, the noble Gladiator, with her decks clear for action, and her brave crew awaiting in eager silence, the nearer approach of the piratical vessel, we will proceed to give our readers as much information of the previous character of Captain Roderick Rowland, as is consistent with the present condition and future progress of the scenes of our story, in some of which he is destined to act a conspicuous part. Descended of wealthy, honorable, and respectable parents, who resided at the time of his birth, (which event happened some forty years before the commencement of our story,) young Rowland, gave during his boyhood such evidences of extraordinary natural capabilities, and superior intellectual capacity, as led those who were connected and acquainted with him to suppose that he might, at some future day, rise to a high rank in the British navy, for which service he seemed to have an unconquerable predilection, and which he entered as midshipman at the age of sixteen. Then it was that his true character began to develope itself, so that during his first cruise, its natural deformity became so apparent as to cause the rest of the officers to look with fear and astonishment upon one, in whom the gifts of extraordinary talents seemed to have been lavished, only to become blended with cunning, artfulness and licentious profligacy, whose disposition was mean and avaricious, and whose temper, though not violent, was cruel, revengeful and unforgiving. Although young Rowland was also a complete master of the art of dissimulation he did not deem it worth his while to exercise it among the young gentleman of his mess, and he had been but a short time on board His Majesty's ship Vixen, before he was very much feared, and very cordially hated by his equals, whilst he was looked upon with uneasiness and disgust by his superiors. All these things combined together, rendered Rowland's situation anything but agreeable; so after having been a twelvemonth in the service, he very abruptly left it by taking, what is vulgarly called, a 'French leave' of the Vixen and her officers, whilst that vessel was taking in provisions and water at the island of Madagascar. Here, Rowland, at the age of eighteen, soon fell in with a gang of American and English bucaniers, who, some years previous to that time, had pitched upon this island as a convenient rendezvous to which they might be easily able to repair for recruits and recreation after having, (as they often did,) successfully robbed the rich homeward bound East Indiamen, for whom they usually laid in wait near the pitch of the Cape of Good Hope. It required but very little persuasion on the part of the pirates to induce one to join them, whose spirit was congenial with theirs, so he very soon became one of the most active and daring of their number. Courage, cunning and cruelty were considered by them to be the most important qualifications of a bona-fide bucanier, and they soon found that these were possessed by Rowland, in a most superlative degree, and this added to the influence of his talents and early education, caused him to rise rapidly to a station of command among them. As it was his motto 'to make hay while the sun shines,' he sailed as soon as possible from Madagascar, from which he had not been absent but twenty days when he fell in with and captured a Spanish Galleon, bound from Genoa to Lisbon, laden with a large amount of gold and silver ornaments, which was the property of the church, and was under the care of a number of ecclesiastics who had taken passage in the unfortunate vessel. There were a number of other passengers on board, amongst whom was Don Fernando Herrera, who was accompanied by his daughter a beautiful Castilian maiden, then about seventeen years of age, who doated upon her father with all the fondness of a pure and filial affection. As Rowland acted almost invariably on the principle that dead men tell no tales, he caused all the passengers to be put to death, in detail, until it came the turn of Herrera. As he was about to be cast into the sea, his daughter sprang wildly forward, and kneeling before the cruel pirate captain, she beseeched him in such earnest and pathetic tones to spare her father's life, or let her die in his stead, that Rowland, fired by the voluptuousness of her extreme beauty, and perhaps touched by her tears, promised to spare her father on condition that she would become his wife. Such were the dread alternatives. Death for her father and herself on one hand, and the sacrifice forever of her happiness and peace of mind on the other. In the extremity of her terror, Clarice, (for that was her name,) chose the latter, and that very same night she was united to Rowland, by her own priest and confessor who was compelled to officiate in the ceremony, and her father was compelled to will all of his vast riches in the event of his death to his murderous son-in-law. After having taken to himself a wife in the above strange and summary manner, Rowland repaired to the West Indies, where his father-in-law died soon after his arrival, leaving to the pirate, a vast amount of money and other property, which enabled him to establish himself at Havana, in a most splendid and magnificent manner. His inordinate desire for wealth however still remained unsatiated, and although he left off all open communication with his former associates, (the bucaniers,) still he secretly patronized them, and in return was made acquainted with the result of all their efforts and received a goodly share of their plunder. Three years had passed away, and Clarice in the interim had presented her husband a boy, but by this time the Spanish authorities had got wind of the manner in which Rowland had obtained his riches, and he was forced to leave Havana, and most of his vast property at the same time, and sail clandestinely and under an assumed name for England. Here he took up his residence in an obscure street of the metropolis where after the expiration of two years, Clarice gave birth to a daughter, whilst relentless death hovered over the fair form of the mother, and soon after removed her gently from the sin and sorrows of a wicked world. Soon after the decease of his wife, Rowland suddenly left England, but he returned again about a year previous to the commencement of our story, and managed, through sundry letters of recommendation which he himself had forged, to gain the command of the Gladiator. Leaving the intervening events of his life to become elucidated in the further progress of our story, we will here put an end to our long but important digression and return again to the unravelling of its main thread, by transporting the attention of our readers once more to the deck of Rowland's noble ship. Here every one was at his station, every thing in its right place, and every soul on board the Gladiator was almost breathlessly watching the near approach of the piratical brig, as, with the horrid black flag flying from her main royal truck, she came sailing majestically down upon the ship, and it was expected by the crew of the latter that an instant combat between the two vessels was inevitable. Instead of jumping immediately, as was generally his wont to obey Rowland's orders, the first lieutenant stood perfectly still, regarding the captain with a puzzled and undecided manner, as much as to ask if he had rightly understood the purport of his superior's words. There was something in the cold, calm, passionless manner of Rowland, which awed the lieutenant into compliance, notwithstanding he was naturally a brave man, and he therefore walked forward and repeated to one of the men the captain's order, which a moment afterwards was sullenly obeyed, then a shout of exultation rose up from the crew of the piratical brig, whilst a gun was fired in triumph as her commander prepared to board the ship which had been so ingloriously placed without a struggle within his grasp. 'And you must be a cold-blooded, heartless villain,' exclaimed Arthur, irritated beyond endurance at the scorching irony of the pirate's tone. 'Rather let me die,' exclaimed sweet Ellen Armstrong, as, quicker than thought, she sprang between the murderous weapon and Arthur's person. The pirate fired, but the ball did not take effect, and was about to present his second pistol, when he suddenly stopped, and thus addressed a portion of his comrades, who had in meantime gathered round this strange scene. Henry Huntington and Pat O'Leary, the Earl's Servant, start upon An Exploring Expedition—Its Strange and Sudden Termination at the Pirates' Cavern. With a love of adventure, which no sense of anticipated or real danger could restrain, glowing upon his mind, and beaming forth from his handsome eyes, did Henry Huntington, upon his first landing upon the island, declare to his companions that he intended to pass the day in exploring its beautiful though limited dimensions, and when hunting for curious sea-shells and other marine curiosities, wherewith to enrich a sort of miniature museum which he had commenced some years before in merry England. 'Is that your real intention, Henry, or are you joking,' asked the earl, as the young man finished speaking. 'I certainly intend, sir, to spend the time allotted to me here, in doing as I have said,' replied Henry. 'Then it is my opinion that you will have a tiresome time of it,' said the earl. 'That would be ungallant, without dispute,' chimed in 'sweet' Ellen Armstrong. 'Do you hear that, Patrick,' asked the earl? 'Well, Patrick, let us take a start now, then,' said Henry. 'Fast as yer honor plases,' replied Patrick, and so saying, he immediately followed Henry, who had advanced some paces ahead of him, and they then proceeded both together, on their intended expedition. 'But how should you like to live here altogether?' asked Henry. 'What, alone?' again asked Huntington. 'Then I guess we will stop here,' said Henry. 'What do you mean,' exclaimed Henry, starting to his feet. Turning his eyes in the direction intimated, Henry immediately discovered the three strong men to whom Patrick had alluded, and they seemed at the same time to have seen him, for soon afterwards he observed that they were descending the hill, and walking swiftly towards the place where he and his servant were standing. 'By the boys of Bulskerry, them divils are all armed, every mother's son of them,' exclaimed O'Leary, as the strangers gained a near approach to them. Having arrived at this very logical, and important conclusion, our honest Hibernian flourished his shillalah above his head, but the next moment it was snatched from his grasp by Blackbeard, who cast it away to a considerable distance. Whilst this curious transaction was in progress, Henry Huntington was busily engaged in parrying the thrusts which were aimed at him by the third pirate, with his stout walking stick, (which might, perhaps, be more properly termed a heavy club,) and so lustily did he lay about him, that he soon managed to knock his adversary down, through the agency of a blow, (which, as it was afterwards discovered, fractured the villain's skull,) when Blackbeard and the other man, who had just got clear of Pat, fell suddenly upon Henry Huntington, and soon disarmed him. 'Dost thou know, rash and fool-hardy man, that you have incurred death, by daring to resist my authority, and wounding one of my comrades? 'God help her then,' exclaimed Henry, hardly knowing what he said. 'Amen,' exclaimed the pirate, in a tone of cruel mockery. So saying, Blackbeard turned quickly away, and soon disappeared through the adjoining forest. The cavern to which the pirate had alluded in his last speech, as being under the 'palace,' was a large, subterranean appartment, which was generally used by the bucaniers as a place of storage for their ill gotten plunder. This cavern had had many, and various ways of entrance, the principal one of which, was near the outside of the palace, and was opened by removing a broad, flat stone, which had been ingeniously set upright in a small banking, apparently of earth, which surrounded this singular abode. We might as well say here, as anywhere, that we are well aware that the representation given by us of the pirate's palace and cavern, will be looked upon by many as unnatural and improbable, but when they consider that the bucaniers of that period were very numerous, and consisted of men of almost every variety of genius, which must, even in its times of relaxation, be employed about something, they will cease, perhaps, to wonder that the ingenuity of such men should be exerted in building convenient, and even elegant structures for their accommodation, and their extensive means of enriching them with ornaments the most costly, with which the numerous Indiamen they captured were freighted, will not be farther questioned. But to return to our story. Finding himself surrounded by four or five armed and desperate men, Huntington, concluding that resistance would be in vain, signified his readiness to follow them, whereupon he was led by two of their number to the cavern above alluded to, whilst the remaining pirates bestowed their attention upon poor Patrick O'Leary, whom, (as he had not yet recovered his powers of locomotion,) they lifted upon their shoulders and bore him away after his master, much in the same manner as they would have carried a slaughtered beast. 'Which one do you mean? He's got two of them,' said Poplin. 'Ah, yes, so he has, I recollect now. I mean both,' said Pepper. 'What, has the pretty little craft arrived?' asked Pepper. 'She has,' rejoined the other. 'Of course it is,' replied Poplin, significantly. 'She carries a Captain Rowland also,' said Poplin, drily. So saying, a few moments afterwards, Pepper and his companions departed, leaving Henry Huntington and Pat to their own reflections. What these reflections were, we shall leave for the present to the imagination of our readers, and resume in our next chapter the further adventures of Blackbeard, Arthur Huntington, and sweet Ellen Armstrong. Interview between Blackbeard and Ellen—Attempted Murder of the latter. Interference of Elvira. Blackbeard's Departure. Elvira's History. The Escape. 'Had you any right to put such a question to me, I should not hesitate to answer it,' replied Ellen, who by this time had attained a sort of desperate courage which enabled her to bear up under the unaccountable horrors of her situation. 'Then your blood be upon your head!' exclaimed the pirate, as springing suddenly forward, he inflicted a severe wound upon the person of sweet Ellen Armstrong, with his poniard, which caused her to fall fainting and bleeding upon the floor of the cabin. 'My God, what have I done,' muttered Blackbeard, as he gazed upon his prisoner's prostrate form. 'Murdered your sister!' exclaimed a shrill female voice, which emanated from a person who had entered the cabin unperceived, just after Ellen was wounded. 'Ha, who is that, that speaks of murder!' exclaimed the Pirate involuntarily. 'It is your mother, Elvira, who accuses you of having murdered that beautiful girl, who now lays gasping at your feet,' replied the strange female, who although she was far advanced in years, beyond the prime of life, still possessed a tall and commanding form, together with features, which, though they were somewhat wrinkled and withered, had once been pre-eminently fair and beautiful. 'Am I not thy father's wife, Herbert?' replied the female. 'But I am not a murderess,' replied Elvira. 'That is more than I could swear for,' said Blackbeard. 'At least I never killed my sister,' rejoined Elvira. 'What do you mean to insinuate by that?' asked the Pirate as his muscular frame trembled with a sort of indefinable emotion. So saying, and without awaiting Elvira's reply, Blackbeard immediately left the cabin. 'Lower away the boat there,' thundered forth the pirate, as he gained the brig's quarter deck. A score or two men promptly executed this order, the boat was soon manned; Blackbeard assumed his station in the stern sheets, and was soon pulled along side of the Gladiator, whose deck he quickly reached, where he earnestly inquired of the officer in charge, for Captain Rowland. Upon hearing this, Blackbeard without stopping to reply, hastily re-entered his boat, and ordered his coxswain to steer directly for the shore, which he soon reached, and having landed, made the best of his way to the palace, where we will for the present leave him, whilst we look further after the fortunes of our heroine. No sooner had the pirate, taken his departure from the cabin, than the strange female hastened to the assistance of the wounded girl, whom she supported in her arms, and then conducted her into a small but neatly furnished state-room, which was Elvira's own apartment, where she had partly overheard the altercation which took place, as before related, between Blackbeard and Ellen, and from which she had noiselessly and unperceived entered the main cabin just after our unfortunate heroine had fallen to the floor. Here Elvira gently laid her fair charge upon her own soft couch, and proceeded immediately to examine her wound, which, although it had bled copiously, was but slight, then, after carefully dressing it, this strange woman, by the aid of appropriate restoratives soon succeeded in restoring 'sweet' Ellen Armstrong once more to consciousness. A strange and unaccountable interest in the words of the dejected being who stood before her, having taken possession of the sympathizing mind of our heroine, she signified to Elvira, that she felt strong enough to listen to any thing which might serve to explain the horrible mystery connected with her sudden captivity, and the subsequent events attendant upon it. 'I was born in Lincoln, near fifty years ago. My parents were poor, but respectable trades-people, who, had they been permitted to live, until I, their only child, had reached the age of womanhood, might have, by religious counsel and strict government checked, if not wholly obliterated the reckless propensities of my passionate temper and wild, wayward disposition. But before my years had numbered ten, my parents both died within a few weeks of each other, leaving me to the care of a tyrannical old aunt, who I soon afterwards found, managed to hide, under an artful affection of religion and prudery, a base malignant and sensual character. I was immediately sent by my aunt to the parish-school, where, being naturally tractable and apt to learn I soon acquired the rudiments of a good education, and besides, I learnt also to become an expert needle-woman. No sooner did my aunt find that I was mistress of this latter accomplishment, than she took me at once from school, and compelled me to toil day and night at my needle, refusing me at the same time all necessary rest and recreation. 'Young and high-spirited as I then was, I found it impossible to bear such brutal treatment, and one day when I was about fourteen years of age, in a fit of anger and despair, I left the home of my cruel aunt, and found myself a wretched wanderer in the streets of London, without money, home, or friends. Still I wandered on, not realizing the horror of my situation, till the shades of evening began to cover the city, and the harsh knawings of cruel hunger, began inexorably to crave their natural satisfaction. Then it was that I felt myself compelled to look around for some place of shelter, but could find none, and would have returned again to my cruel aunt, but alas, all my efforts to find her habitation proved utterly fruitless, and having by this time reached the banks of the Thames, I plunged without a moment's hesitation, into its dark waters, resolving to end at once a life which promised nothing to its possessor, but wretchedness and wo. But my fatal resolution was frustrated by a man, who, unperceived had for some time previous watched my wild and desperate course, and who jumped into the water as I a second time rose to its surface, caught me by the arm, and held me tightly with one hand, whilst with the other he swam toward a small vessel, which, being but a short distance off, he managed to reach in safety. 'Having received on board this vessel every attention which the greatest delicacy and kindness could dictate, I soon became impressed with a strong desire to become acquainted, with the character and designs of the person who had so disinterestedly preserved my life. It so happened that during a short illness which was occasioned by the cold bath I had taken in the Thames, I was assiduously attended by a female, who, as I afterwards learnt, was the wife of one of the officers of the vessel. To this woman who was very kind and attentive to my wants, I applied for the gratification of my curiosity concerning my preserver, upon which she informed me that he was a young Spaniard of good family, who commanded the vessel in which we were then situated. 'This was all I could gather from her, but a day or two afterwards I had perfectly recovered so that I could verbally thank the generous man who had saved my life, to his face. After having listened with modest though marked attention to my warm protestations of gratitude, Don Almanzor, (for such was his name,) begged me to relate to him the untoward events which had driven me to desperation and almost death. 'In accordance with his request, I gave him a brief history of my previous life, after which in view as he said, of my helpless and desolate condition, he offered to take me to his home in Cuba, where he informed me I should become an inmate of his father's family, he taking upon himself to act towards me, in every respect, the part of a friend and generous brother. 'With redoubled expressions of sincere gratitude and respect, I eagerly consented to abide by Almanzor's generous offer, and a few days afterward, the vessel in which I had so strangely become a passenger, sailed for Havana, where she arrived after a pleasant passage of three weeks. 'During the voyage, Almanzor treated me with the most delicate attention and respect, and as he was young, handsome, and unmarried, you will not be surprised when I inform you, that long before its termination, I became deeply and fervently attached to him. However, I resolved to keep my passion a secret within my own bosom, until I should know whether my affection would be reciprocated by its object, and in the mean time, I became regularly domesticated in the family of Don Almanzor, which consisted of his father, who was a rich old Spanish slave-dealer, his mother, and himself. The old people treated me in all respects, as though I had been their only daughter, and for two years I lived with them in the enjoyment of a pure and tranquil happiness, which, at the expiration of that time, was enhanced beyond measure, by an honorable offer on the part of Almanzor, of his hand and heart. As might naturally be supposed, I readily accepted an offer which agreed so well with my own inclinations, and shortly afterwards we were married, and after two more years of increased felicity had passed, I became the mother of a lovely daughter. 'My husband was at this time absent on a trading voyage, and the vessel that he was in having encountered a severe hurricane, was stranded, and every soul on board of her found a watery grave. 'This dreadful news was brought to me by Captain Rowland, who visited the island at that time, in the capacity of master of an English brig, and need I say that the horrid tidings almost drove me frantic. 'And who is this Captain Rowland?' asked Ellen, eagerly. 'He is a noted pirate,' replied Elvira. 'Your situation must have been terrible beyond expression,' ejaculated Ellen, who had become deeply interested in the story of the unfortunate woman. 'God knows that it was so,' answered Elvira. 'The discovery of his deception came upon me suddenly, like a thunderbolt from the clouds of heaven, and I upbraided him for it in the bitterness of my heart, and he answered my reproaches at first with scornful laughter, and afterwards with a relation of the history of his past life, during which, to my utter astonishment and surprise, I learnt that he had been once before married, but that his wife had recently died, leaving two children, a son who was at that time in the vessel with his father, and an infant daughter, concerning whom, I could only then learn from Rowland, that she had been left in London, in the hands of such persons as would take good care of her. 'Oh no, that is no part of the purpose of those who have detained her,' answered Elvira. 'And who may his son be?' again inquired Ellen. 'God of Heaven! can it be possible?' exclaimed the fair Ellen. 'It is no less possible than true,' replied Elvira. Upon hearing this, Elvira immediately left the cabin, but, to Ellen's greater joy, she shortly after returned, followed by Arthur Huntington, who assisted the females into the boat, after which he entered it himself and succeeded in getting, unperceived, out of sight of the brig, upon the bosom of the wide ocean. Singular Interview between Blackbeard and his Father. The Sloop-of-war. Meeting of Rowland and Henry Huntington. Life or Death. The Surprise. The Fight. The Result. Joyful Meeting. The Double Bridal. Happy Conclusion. 'Be hung, I suppose,' muttered Rowland from between his teeth. 'Not quite so bad as that I hope,' rejoined Blackbeard. 'How so, father? What do you mean?' asked Blackbeard. 'There should be thirteen, I think,' replied Rowland. 'Which one of them was it who dared to strike one of us?' asked Rowland. 'She is, I believe, in the next room with Violette,' answered Blackbeard. 'Herbert, I have resolved that you shall marry that girl,' said Rowland abruptly. 'I have murdered her,' replied Blackbeard, who then related to his father the conversation that had passed between himself and Ellen, and its terrible result. 'I hope she is,' replied Blackbeard, ironically. 'If I follow her I shall be sure of Heaven, then, which would by no means be the case if I followed you in your exit from the world,' muttered Blackbeard. 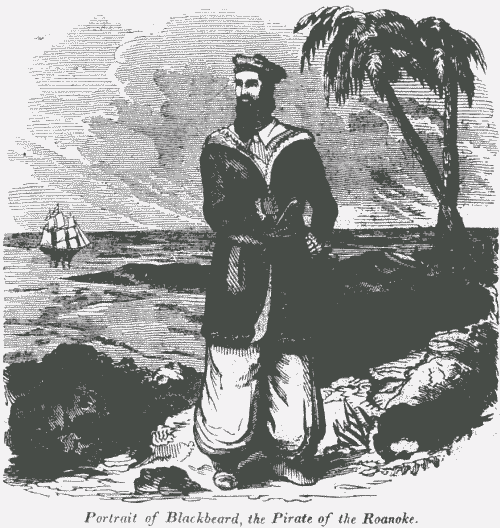 'But what shall be done with the passengers and crew of the Indiaman,' asked Blackbeard. Having received the above orders, Blackbeard departed upon his errand, and soon after, Pepper entered Rowland's presence, followed by Henry Huntington and his faithful servant, Mr. Patrick O'Leary. 'Since the mysterious events of this morning I have ceased to be surprised at anything,' answered Henry. 'You was treated by me, as in my estimation, you deserved to be,' replied Henry, boldly. 'Oh! say not so, but recall your cruel words!' exclaimed Mary Hamilton, as she rushed into Rowland's presence from the inner apartment. 'Ha! who have we here?' exclaimed Rowland, as the wild tones of Mary's voice fell upon his ear. For some moments after the conclusion of Rowland's speech, Mary uttered not a word, but stood with uplifted eyes, as if in silent suppication to Heaven for guidance in this her hour of peril and danger. 'Then an angel spoke,' exclaimed Henry. 'By the piper that played before Moses, and I can swear on the blissed book to that same, masther Henry,' ejaculated Pat O'Leary, who, with a countenance swaying alternately from laughing to crying, formed a somewhat ludicrous contrast to the rest of the group. 'Take that young sprig of nobility below again, Pepper,' exclaimed Rowland. Having thus spoken, Miss Hamilton immediately retired into the adjoining apartment. 'Lead on,' answered Henry, and so saying he followed Pepper towards the door. 'Be the bones of St. Patrick, an' sure that is the most illegant news that iver graated the ears iv a jintleman in disthress!' exclaimed Pat O'Leary, who was in an ecstacy of joy at the prospect of his speedy deliverance. 'What is to be done, father?' asked Blackbeard. 'In the name of King Lucifer, then, I will never surrender,' exclaimed Rowland, as he aimed a blow at the officer with his cutlass. The fight thus began, and soon became general, but although the pirates fought desperately, they were soon overpowered by the superior numbers and coolness of their adversaries, and as a pistol shot laid Rowland upon the floor, the few desperadoes who remained, agreed to surrender at discretion, with the exception of Blackbeard, who fought like a tiger, until he fell covered with wounds by his father's side, the red current of life mingling with that of his unnatural parent. Here the sound of his voice was heard no more. Rowland was dead! As his cold hand fell lifeless by his side, it rested upon the cold clammy cheek of his son, and it became evident to all around that the short but eventful career of Blackbeard, the far-famed Pirate of Roanoke was forever ended. Although the Fury had managed to outsail the sloop-of-war, on the day previous to the events above related, the captain of the latter, well knowing that the island of Trinidad had long been a piratical rendezvous, naturally supposed that the brig would stop there, and as he made the land just before night-fall he determined the next day to explore the island, hoping that he might thereby be enabled to trace the desperadoes to their lurking-place. The wind changing during the night, brought the Vengeance, next morning, some few miles to the leeward of the island, on the side opposite from that where the Fury had grounded, so that it was late in the afternoon before she could get near enough to lower her boats. This request was speedily acceded to, the sails of the Vengeance were hove aback, and the next moment Arthur Huntington, accompanied by Ellen Armstrong and the pirate's wife, were safe upon her deck, where the former lost no time in making the captain of the Vengeance acquainted with the events which had that day transpired, whilst Elvira volunteered to direct the officer who had been entrusted with the command of the boats, to the pirate's palace, which otherwise he might not have found. Before midnight, the whole party who had landed upon the island in the morning, met each other once again, upon the deck of the Vengeance, and many and sincere were the thanks they returned to Heaven for their deliverance out of the murderous hands of the pirate of the Roanoke. Five years after the occurrence of the singular events above narrated, the mansion of Lord Armstrong, situated near the mouth of the Roanoke river, in the province of North Carolina, was brilliantly illuminated, as if for a season of great rejoicing. And such indeed was the fact. Soon after night-fall a gay party had assembled in the earl's parlor, and shortly afterwards entered Henry Huntington, holding by the hand the fair and stately Mary Hamilton, immediately followed by his brother Arthur and sweet Ellen Armstrong, the whole party being succeeded by a clergyman, attired in the sacerdotal robes of the church of Rome. That night, dear reader, witnessed the consummation of a double bridal. Kind reader, it only remains for us to say that the descendants of Arthur and Henry Huntington still continue to reside upon the pleasant banks of the Roanoke, and often take great pleasure in recounting to each other the exploits of the far-famed Blackbeard, and the providential and almost miraculous escape of their ancestors from the blood-stained hands of Herbert and Roderick Rowland.